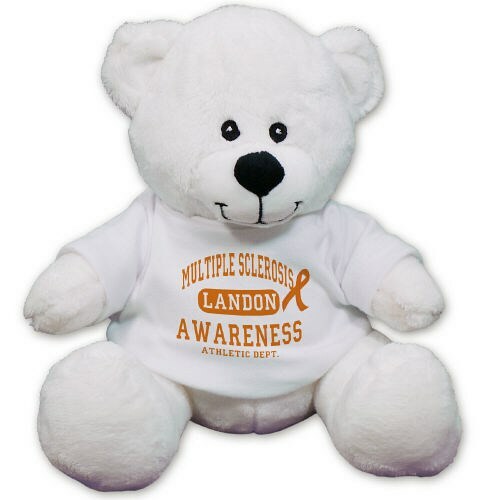 Personalized Mulitple Sclerosis Awareness Teddy Bear - 8"
Support MS Awareness with this great Multiple Sclerosis Awareness Teddy Bear, whether it’s your Mother, Father, Sister, Brother, Friend or any loved one you know battling with MS. This attention grabbing design is featured on our White Timothy Bear. Timothy Bear is filled with extra stuffing to make the ideal handmade sitting bear who measures 8” tall. Free personalization of any name is included on the t-shirt. We will also include free gift wrapping and a free gift card to create a thoughtful presentation. Additional Details Multiple Sclerosis affects approximately 400,000 people in the US and an estimated 2.5 million worldwide. By showing awareness, you will help support MS and also help fund research for a cure. Shop 800Bear.com for all of your Awareness Plush Animal Gift Ideas.